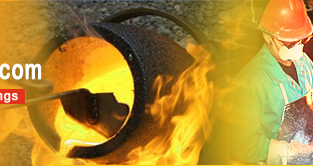 Introduction: A age old metal melting device, the cupola furnace is use to melt cast iron, bronze and ni-resist iron. A Cupola or Cupola furnace is a melting device used in foundries that can be used to melt cast iron, ni-resist iron and bronzes. It is widely used because the operating methods are simple, economical and eco-friendly. History: Cupola furnace is a very old and still a widely used method for making cast iron. In some place cupola furnae has been replace by the less fussy electric furnace cupola furnace is still used for melting some special metals. Though the cupola furnace is said to have been used for the 3rd Century B.C. by the Chinese, the first cupola furance was officially known to have been made by René-Antoine Ferchault de Réaumur around 1720 AD. The Appearance: Cupola furnace is cylindrically shaped and place on a four legged structure for a support. The shell of the cupola, being usually made of steel, has refractory brick and refractory patching material lining it. The bottom is lining in a similar manner but often a clay and sand mixture may be used, as this lining is temporary. The bottom lining is compressed or 'rammed' against the bottom doors. Some cupolas are fitted with cooling jackets to keep the sides cool and with oxygen injection to make the coke fire burn hotter. The other equipment are arranged around the cylinder and the bottom of the cylinder has a door thrugh which the molten metals can be dropped down. The top of the cylinder is usually open for the gas to escape. A typical cupola melting furnace consists of a water-cooled vertical cylinder which is lined with refractory material. The metal and the fuel ingredients like coke and limestone are fed into the cylinder. Air which contins air goes in through the bottom. The coke is heated and the metal gets melted. In some cases this process is preferred to electric furnace because mos the impurities are removed while the iron is melted. Operation: To begin a production run, called a 'cupola campaign' the furnace is filled with layers of coke and ignited with torches. Some smaller cupolas may be ignited with wood to start the coke burning. When the coke is ignited, air is introduced to the coke bed through ports in the sides called tuyeres. When the coke is very hot, solid pieces of metal are charged into the furnace through an opening in the top. The metal is alternated with additional layers of fresh coke. Limestone is added to act as a flux. As the heat rises within the stack the metal is melted. It drips down through the coke bed to collect in a pool at the bottom, just above the bottom doors. A thermodynamic reaction takes place. The carbon in the coke combines with the oxygen in the air to form carbon monoxide. The carbon monoxide further burns to form carbon dioxide. Some of the carbon is picked up by the falling droplets of molten steel and iron which raises the carbon content of the iron. Silicon carbide and ferromanganese briquets may also be added to the charge materials. The silicon carbide dissociates and carbon and silicon enters into the molten metal. Likewise the ferromanganese melts and is combined into the pool of liquid iron in the 'well' at the bottom of the cupola. Advantages: Most of the impurities in the charges are removed while the ore is melted. 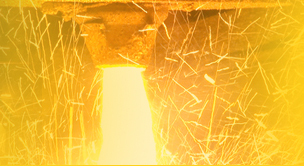 The process which is simple and economical can be used to melt a wide rang eof metals. An above all cupola furnaces are eco-friendly since they take the heating energy from the coke in the furnace. electricity that first has to be generated.